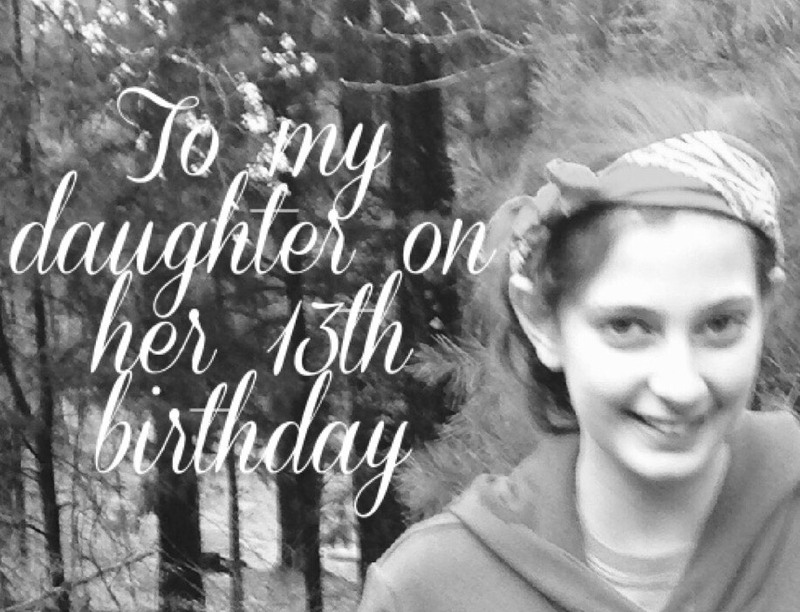 This is a letter I wrote to my daughter on the day she turned 13. I am sharing it with you with her full permission. You are now a teenager. And I thought I’d done this all before because your brother came first. But yet somehow, it’s so very different with you. I watch you and I see reflected back at me the girl I was at your age. My insecurities, struggles, and questions. You are so quiet and observant, processing things internally. My Meme always told me that my eyes were telling on me, and yours certainly do the same thing. I love reading your eyes because they tell me so much more about your feelings than the few words you’ll say. But sometimes it’s hard to face the reality of what your eyes tell me. It is heartbreaking to know that there’s nothing I can do, or nothing I should do, to take away those feelings you have. I can’t keep you from experiencing this life for yourself and growing into who you’ll be on your own, even though sometimes it is tempting. You see, there’s a lot of stuff in this growing up process that I wish you could skip. I’d like to just tell you everything you should know and somehow have you take my word for it rather than learning the hard way. I guess I want to save you some pain, but selfishly I think it’s more about saving me the pain of having to watch. Because ultimately for you, the temporary hurts and hard lessons will make your life grander and richer. So we must both endure, and sometimes I just have to keep my mouth shut. I remember some days as a teen where my heart was breaking. I thought my feelings were silly and trivial and that I probably shouldn’t feel them so I said nothing to anyone. You are one of the toughest people I know, and it’s a quality that demonstrates amazing strength. You push through physical pain so much of the time. You are able to set emotions aside to do hard things. But I need you to know that you don’t have to be tough all the time. The thought of you feeling that kind of heartbreak and keeping it all to yourself is so hard for me. I would do anything to help you understand that I want to share in your broken heart, and that carrying it alone will hurt so much worse. I wish I could be the safe place for you to let those things out. But if I am not that place, I pray that you’ll find another healthy and safe person or outlet for those feelings. I know I’ll have to let you do it your way. but please don’t be tough all the time. I want to tell you that it’s going to get better. That middle school is filled with braces and puberty and hormones and trying out for the team. It’s figuring out how to act and what to do. You’re looking for your niche, and you’re paranoid about everything. And in a couple of years, all of your growing up problems don’t just magically go away, but they are so much better. You just have to hang in there for this part of life. When you don’ t make the team, I’m so over-the-moon proud of you for trying. I’m beaming that you were brave enough to go for it when it wasn’t a slam dunk. And more importantly, I hope that you’re proud of yourself. There are qualities in you that are starting to fade. The world is taking them from you by telling you that it’s not what everyone else is doing, or that there are others who do it better than you. I don’t know if this is just a phase of the paranoid middle-schooler or if you are conforming to the world’s desires. I’m praying that you’ll land somewhere within the balance of how God made you and how he is trying to shape you. Please don’t let the world take your uniqueness away from you. The thought of this world losing the person that I’ve seen in you is heartbreaking. This world needs the real you, so please be brave and don’t conform. I want to tell you that you’re beautiful and make you really believe it. I want to explain how I see beauty in you because of who and how God made you. Your outward appearance only shines and radiates what’s inside. I want you to know that there is such beauty in every person that is good and kind and joyful. But it took me so long to gain this perspective, and I know I cannot skip the process of you understanding this for yourself. I want to tell you that your character is what I love the most. The way you give generously, look out for those around you and fight for justice. Your loyalty, your honesty, and your responsibility. The way you can laugh at yourself. They way you handle success, and more importantly the way you handle failure. Your heart is beautiful. Everyone doesn’t know that yet. Actually, everyone never will. You’ll let in a chosen few over your lifetime. I know, because did I mention that you are like me? Your real person is a treasure reserved for those few that you let in and that will really take the time to get to know you. And I feel so incredibly honored to be in that select group. Being your mom is one of my very favorite things. There are no words for how much I love you.